The Motors and gearboxes from cordless drills have long used as the basis of the drive train of the smaller classes of combat robots. They are relatively cheap and powerful with two being enough to give a 12lb Hobbyweight or 15lb BotsIQ good performance. 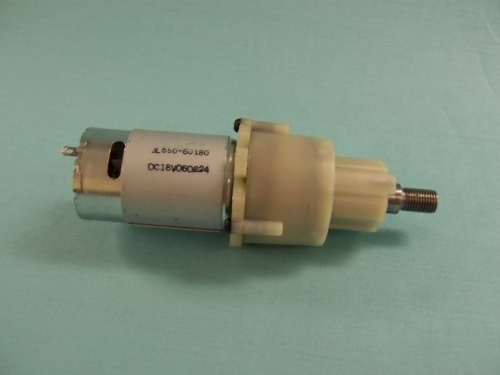 They are the motors used in the CS3 and SS1 kits. They have all metal gears, a 36:1 gear ratio and give 550RPM at the nominal voltage (Warning: The Harbor Freight Drills they come from state that they are 900PRM. This is incorrect) . The gearboxs are locked in drive and the screws that attach the motor to the Gearbox are secured with loctite. The 18v versions will perform well using 2000mAH 6S LiPo or 2300 mAH A123 battery packs. Scorpion XXL or Banebots 12-45 ESCs are recommended for use with these motors. They can be easily mounted using the Kitbots mounts and the popular 3", 4" or 5" x 7/8" wheel can be easily attached using the HUBHF hubs. Harbor Freight regularly updates the drills it sells and the 18v one mentioned above is no longer available. I suggest you contact Kitbots before assuming any one the currently sell is suitable for use.